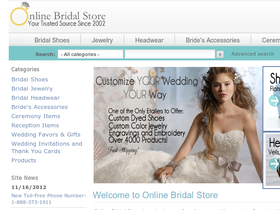 Visit the Online Bridal Store at OnlineBridalStore.com to shop for every wedding accessory you could possibly imagine. Whether you want bridal shoes that you can custom dye, or custom colored bridesmaids jewelry, you can find it at OnlineBridalStore.com. Make your wedding unique with engraved gifts, and shop for invitations, favors, and even garters, all in one, handy location. 58Coupons has all the latest discounts, promotions and coupons available for OnlineBridalStore.com. When you spend over $30 or more at OnlineBridalStore.com you'll enjoy free shipping on your order. Click link to shop. Use this promo code at Online Bridal Store to save $5 on your purchase. Click link to shop and save. Make sure to check out the Clearance section at Online Bridal Store where you can save up to 40% on select items. Click link to see selection. Right now when you refer friends to Online Bridal Store you can get 10% in store credit for every purchase they make. Plus they'll get a coupon for $5 off! Click link to sign up today and save. OnlineBridalStore.com offers bulk discounts on over $600 items. For example, you can save 15% when you buy 4+ of the same select shoes, or 25% when you buy 3+ of the same select favors. Click link to see what products qualify.